Boy, these are starting to feel kind of familiar. We reacted Thursday to the deal that sent Jose Quintana to the Chicago Cubs in exchange for Eloy Jimenez, Dylan Cease, and two lesser prospects. Ryan Schultz gave his instant reaction to the deal and the return (it seems pretty cool), while Nick Schaefer and I discussed the trade at length — as well as a good number of other subjects — on a special episode of The Catbird Speaks. There is and will continue to be plenty to dissect about this trade in the weeks, months, and hell even years to come. But setting all the analysis aside for a second, I wanted to take a second to look back on Quintana’s White Sox career. 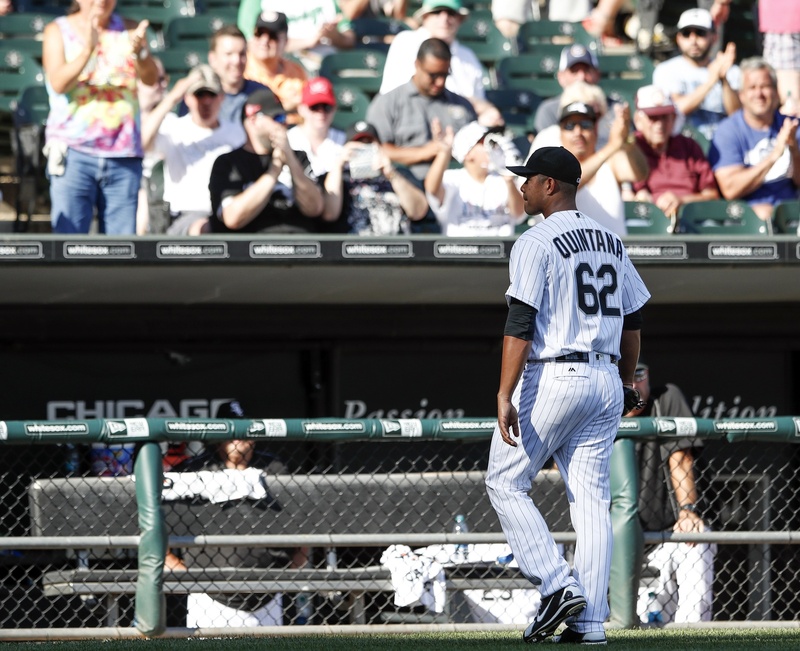 Last September after he made his last start of the 2016 season, I wrote about how easy it is to appreciate Quintana, where he came from, and what he’s become. You know by now that the White Sox snagged him as a minor league free agent, thrown to the curb by the Yankees and the Mets before that for both baseball and non-baseball reasons. Even as he began his ascent to the top of the White Sox rotation, it was worth wondering how this was happening. He seemed to be out-pitching his peripherals in both his abbreviated debut in 2012 and his first full season in 2013. Surely, he was going to fall back to earth. Another pitcher with some fleeting success we’d all forget in a year or two. The following offseason the White Sox were in search of offensive help and had two young lefties coming off of surprisingly successful seasons in Quintana and Hector Santiago. Rick Hahn, though, was reportedly adamant about not including Quintana in trade discussions, and the White Sox wound up hanging onto him while dealing Santiago to the Los Angeles Angels in a deal that netted them Adam Eaton. What the White Sox saw in Quintana became apparent soon thereafter, if it wasn’t already before. His performance improved in each of the next three seasons and he settled in comfortably as the No. 2 starter behind ace Chris Sale on teams that had their eyes on contention. The contention part never happened, of course, and that’s what got us to where we are today. But during Quintana’s ~6 seasons in Chicago, he became a steadying presence during otherwise catastrophic seasons. Whether it was because of the presence of Sale, his conservative demeanor, or his terrible luck in the W-L department, he also flew under the radar to a sometimes laughable degree. But that’s also what made him so easy to root for. It was like he was White Sox fans’ well kept secret. Any time a national outlet would post one of those articles — Jose Quintana is the most underrated pitcher in baseball — we’d snicker to ourselves. WE knew how good he was. WE always knew. We were like Quintana hipsters. We’d been listening to him since he was on vinyl. You should really go back and check out some of his early stuff before he signed with a major label. Another factor, I think, was that his stuff was as subtle as his personality. Sale climbed up on the mound and scowled while blowing high-90s heat and wipeout sliders past helpless hitters. Quintana didn’t quite rock them to sleep, but it was at least something more subdued and difficult to pinpoint. Josh Donaldson’s comments after a vintage Quintana outing against the Blue Jays in April 2016 — 6 IP, 4 H, 0 ER, 3 BB, 10 K — was like music to our ears. Just another rendition of the classics with Jose Quintana. Quintana’s departure was inevitable, whether it was this summer, later on during the offseason, or maybe even next year. And as we’ve repeated time and time again, it’s unfortunate the White Sox have gotten to the point where trading a pitcher of his caliber is seen as a benefit to the organization. But for six years we got to watch his emergence from obscurity to stardom. And we’ll always have that show to look back on — you know, the one at the dimly lit bar that smelled like cigarettes and cheap beer — and say WE remember watching Quintana before he was cool. Sad to see Jose go but the last 5 years have been a huge disappointment, 2017 will be the end of a sour time in White Sox history. I’m sure he’ll accidentally drive to Comiskey Park sometime in August on the way to work. Maybe Coop will call time out and walk toward the mound on the 26th or 27th before he realizes Jose is in a different uniform. The Sox losses will pile up in 2018 and probably 2019, but it will be a new beginning. It could wind up just as bad by 2024, but better to start again than cling to something that in retrospect was making us more angry than happy.